Making homemade venison sausage is very easy however the herbs and spices differ in my 2 recipes below dependent on your cooking process. If you plan to cold smoke your venison sausage then you need to add curing powder. The word venison here in the UK simply refers to meat of the deer but in other parts of the world it can describe the meat from other wild game animals such as moose, elk, antelope and caribou. All of the above are common not just in physical features but also in the strong flavour of the meat and that means you can afford to be a little more liberal in your use of venison sausage spices and herbs. From the hunters perspective, it's also a responsible attitude to want to use up every last bit of the hunted animal carcass and making venison sausage is the perfect way to use up the rest of the meat when the primal cuts have been removed. The second venison sausage recipe is a classic European seasoning designed for grilling over direct heat on the barbecue. Game meat is lean and if you try making venison sausage without the addition of some fat you'll end up with something that is dry and frankly not very nice to eat. Both my homemade venison sausage recipes add pork fat (in the form of belly pork) not just because it needs the fat but because pork fat melts at a relatively high temperature which is also important when we get round to how to cook venison sausage. For both recipes I've chosen to use a hog casing. Note: The yield for each recipe is approximately 4kg (9lbs) so the amount of hog casing that you need to prepare will be approximately 7m (21ft) dependent on the diameter of the casing. 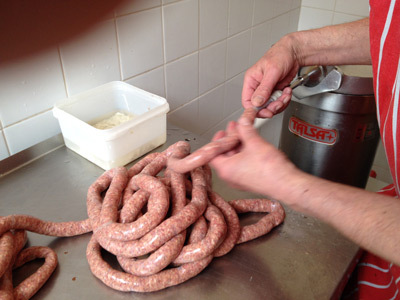 For more about the preparation of hog casings read may article "making homemade sausage". Dice the meat roughly into 1" cubes and run them through the grinder using a 4mm plate. When complete, return the ground meat to the refrigerator. Prepare the venison sausage spices by mixing them all together in a large bowl and ensure that the salt has fully dissolved. Now mix the seasoning together with the ground meat mixture to give an even spread of the spices throughout the sausage mix, this will usually take about 5 minutes of good hard work if doing it by hand. When mixed, run the sausage meat through the grinder on the same 4mm plate and then transfer to the stuffer. When stuffed, make traditional sausage links and store overnight in the refrigerator wrapped in paper towel. This will give time for the venison sausage spices to be fully absorbed into the meat and any excess fluid to be soaked up. The venison sausage spices used in this recipe contain curing powder so this recipe is suitable for cold smoking prior to cooking if you wish. For cooking check my page how to cook sausage. I like to cook this sausage indirectly on my barbecue with added oak wood (or walnut if I can get it). Just place the sausages in a lightly oiled oven tray and cook at 160°C (320°F) for 30 minutes, give the tray a shake every 10 minutes or so to agitate the sausages and you'll have beautiful crisp brown caramelized skins to knife into. This homemade venison sausage recipe has rusk and classic fresh herbs (no spices or curing powder) in the recipe making it ideal for the barbecue grill. The recipe is my own adaptation on one that was given to me by master charcutier Marc Frederic. Note: This recipe uses fresh herbs, don't try to substitute with dried herbs, it doesn't work. Cut the meat roughly into 1" cubes and pass them through the grinder using a 4mm plate. Mix the salt and pepper in with the vegetable stock and ensure that the salt has fully dissolved. Note: You can add the salt and pepper to the finished hot stock and chill it altogether to get a better solution. Add the ice cold stock to the chilled meat and mix thoroughly for about 5 minutes. Work it hard and look for the sign that emulsification is taking place - a gloopy texture. Now add the rusk and mix again so that the rusk soaks up any of the remaining liquid. Place this mix through the grinder once again using the same 4mm plate. Finally, gently fold in the fresh herbs to give an even distribution and specks of colour. Stuff into hog casings, make your links and then refrigerate for 12 hours to let all the flavours come together. To cook, simply un-link the sausages using a sharp knife and place them on a medium grill - use my guide how to grill sausage perfectly. Use an instant read thermometer and look for 72°C (160°F), when reached, take your homemade venison sausage off the grill, rest for 10 minutes and then tuck in.